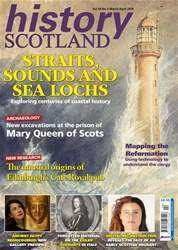 The recent discovery of the earliest reference to a Scottish ship sailing to America (see news report on page 7) reminds us that so much of our history is still waiting to be discovered, rediscovered or reinterpreted. Indeed, the discoveries of pioneer Scots explorers in Egypt in the 19th century are the focus of a brand new Ancient Egypt Rediscovered gallery that opens at the National Museum of Scotland this month. You can read a curator review and see some of the treasures on page 38.